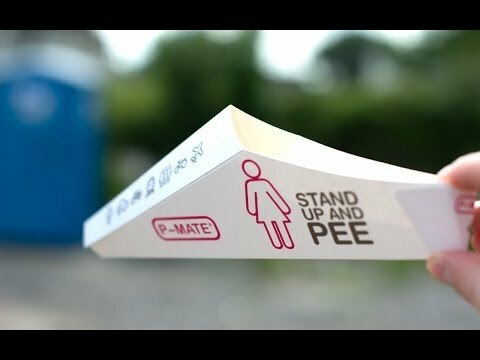 A disposable, sanitary, single use female urination device that allows women to discreetly and neatly stand up and "go." Package Dimensions: 11" x 0.25" x 4"
This product enables women to pee behind a tree if necessary - and to stand up in a public bathroom. Life changing. I like these, though I never have found a use for them. I keep them in my car for emergencies. If a man finds himself without access to a restroom, he can simply turn his back for privacy. Now, the same can be said for women. 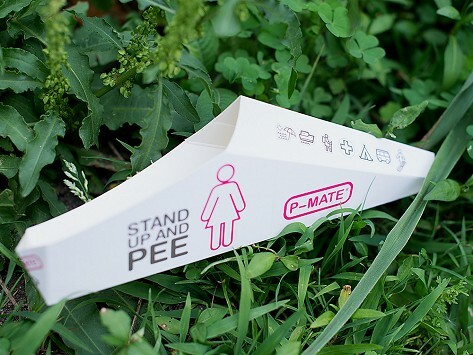 Easy to use with everything from pants and shorts to skirts, P-Mate is a disposable, recyclable, cardboard device that allows women to discreetly relieve their bladders while standing—no dropping your drawers required. Appalled by some of the unsanitary bathroom facilities she encountered while traveling through Indonesia, the Dutch born creator of P-Mate, Moon Zijp, was inspired to come up with a solution. Thoughtfully engineered to fit neatly in a pocket, purse, or backpack, this leak-free, biodegradable device is ideal for traveling, camping, hiking, musical festivals, tailgating and more. It has even been used by women in the military. The folks at P-Mate call it hygienic freedom. We call it a welcome relief from holding it in, withholding liquids, squatting, and hovering.